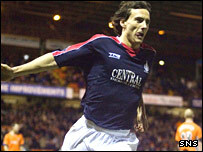 Falkirk striker Alan Gow has agreed a three-year deal with Rangers after signing a pre-contract agreement. Ibrox boss Walter Smith failed to land the 24-year-old before the January transfer window closed - despite making three bids for the player. But Gow will move in the summer and told the club's website: "I'm pleased to sign a pre-contract with Rangers. "However, I'm fully committed to playing for Falkirk between now and the end of the season." Falkirk boss John Hughes said before the transfer window closed that he was aware Gow wanted to join Rangers, but stressed the club would only sell if they received £500,000. Wolverhampton Wanderers also had a bid for Gow rejected, while Aberdeen and Hibernian spoke to the player about the possibility of a pre-contract agreement.